Goldsmith, Rachel was thrilled to be asked by The Salmon and Trout Association to design a brooch for the HM Queen Mother on the occasion of her 100th birthday. 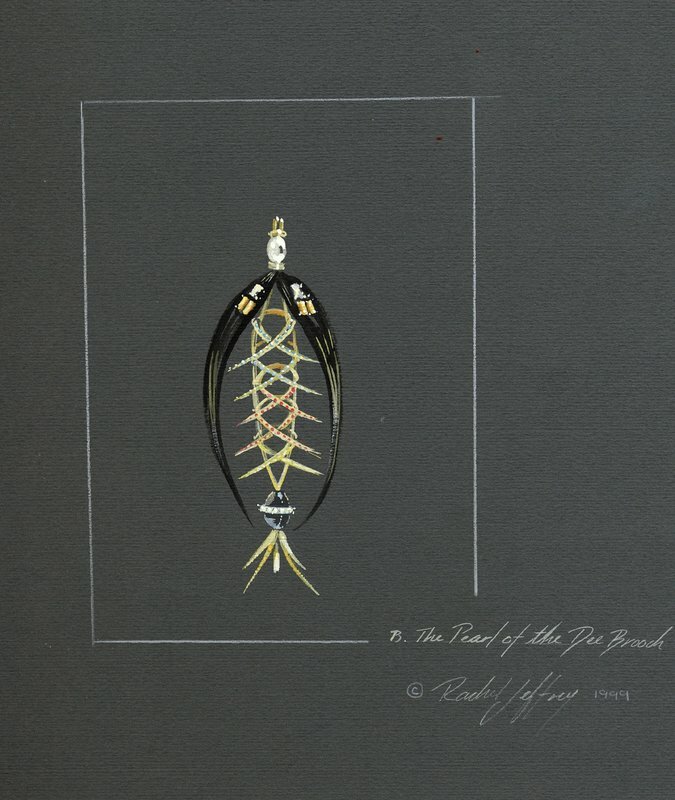 When approached to express this fishing fly in precious stones and metals, Rachel was immediately intrigued by its natural form and function. The intricate art of fly tying from natural materials was close to her own ethos on jewellery making. She was delighted to be a part of this wonderful project. The Pearl of the Dee has been based on a salmon fly of the same name. The fly was designed and dedicated to the Queen Mother, whose passion for salmon fishing along the banks of the Aberdeenshire Dee had always proved a favourite pastime. The design included these elements as well as using her racing colours. The Result was a stunning brooch made of solid 18 carat gold. 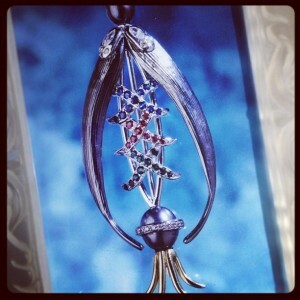 Influenced by the name of the fly, Rachel placed a blue grey pearl at the top to represent the head of the fly. Representing the body, the central lattice work is encrusted with tiny sapphires, emeralds and rubies. The shoulders of the wings are set with yellow and white diamonds and a diamond roundel encircles the base pearl. The tail of the fly has been interpreted in 18 carat gold and resembles an inverted crown. As well as the original presented to the Queen mother, a Limited Edition of 100 brooches was commissioned – one for each year of HM The Queen Mothers life. These were extremely popular, and congratulations to all those who own them! 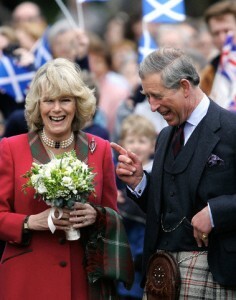 The Original Pearl of the Dee brooch has now been passed on to a new owner in the Royal Family. 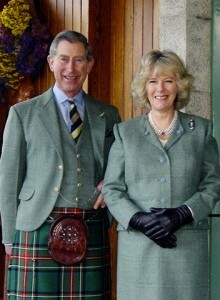 Camilla, Duchess of Cornwall can be seen wearing it in the official engagement photograph of her and Prince Charles taken outside Birkhall in Scotland in February 2005. The photograph can also be seen on the Royal Mail 68 pence stamp, commemorating the Royal Engagement. Camilla, Duchess of Rothesay, also wore the brooch during her honeymooon with Prince Charles for the opening of the Monaltrie Park children playground in Ballater, Scotland, on the 14th April 2005 (as shown above, against red jacket).